A Real Estate Investment Trust (REIT) is a company that owns or finances income-producing real estate. REITs are like mutual funds. REITs provide investors of all types with regular income streams, diversification, and long-term capital appreciation. REITs allow individuals to invest in real-estate properties in a similar way you purchase a stock of a company and own a share. A REIT combines a pool of money from individuals and institutions to buy real estate projects. The Unit holders of a REIT Scheme earn a share of the income produced through renting or selling of the real estate property without actually having to bear the hassle of buying or managing the property on their own. 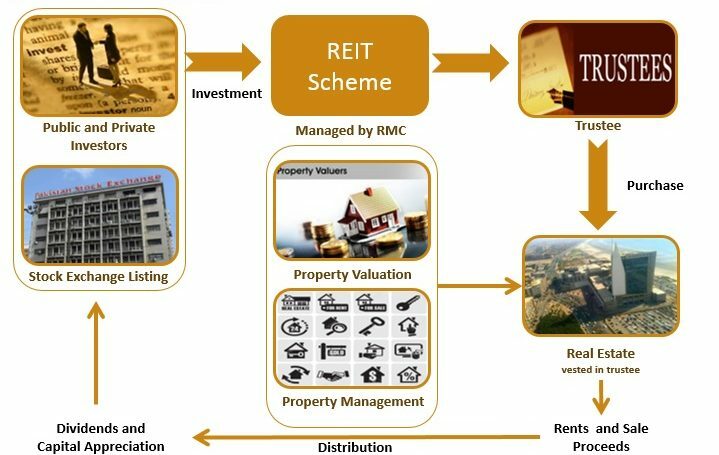 This is a type of REIT scheme which invests in real estate to develop it for Industrial, Commercial or Residential purpose through construction or refurbishment. A rental REIT scheme invests in commercial or residential Real Estate to generate rental income. This is a scheme having both a portfolio of buildings for rent and a property for development. Diversification aims to reduce portfolio volatility for investors. Adding REITs to an investment portfolio reduces risk since REITs have little correlation with other assets, including stocks and bonds. REITs have to distribute at least 90% of its profits as dividends to the unit holders to avail tax exempt status. High payout reduces the risk of management for investors. REITs are wholly equity financed and only unsecured borrowing is permitted under the regulations. Hence, REIT has a debt free structure and free from related cash flow distress and default risks. REITs follow the same rules and regulations of disclosure as other public listed companies. The REIT are required to be listed at the stock exchange which provides investors the option to exit anytime. Moreover, REIT units are priced by the stock market each day and readily respond to the changes in market sentiments.